Answering the Legislative mandate (Texas S.B. 507) for secure, cost-effective A/V recording for classroom applications, the TEKVOX ViewVault is a self-contained, ceiling-mounted audio/video recording system that is capable of recording and storing 6 months (1667 hours) of high-definition video and associated audio. Providing full compliance with Texas S.B. 507, ViewVault is a cost-effective drop-in solution requiring very little setup or maintenance and placing no strain on campus human, network or storage resources. ViewVault operates autonomously based on scheduled, motion-triggered or hybrid recording modes and keeps (only) the most recent six months of recordings on its internal media. The ViewVault can operate stand-alone in 'black-box' mode requiring no network connection or can be remotely managed via wired or wireless networks with TEKVOX's Enterprise Management System. In black-box mode, the system is configured prior to shipment and is placed discreetly in the ceiling tile grid with included camera and mounting accessories. Only a single electrical connection is required. The system automatically goes into operation when powered and no human intervention is required for full SB507-compliant operation. When necessary to view the stored media an authorized administrator can unlock the enclosure and easily remove a small solid-state storage unit with the most recent recordings for quick examination or remove the entire tray-mounted electronics for deep forensics of the entire media system - all media and all system logs are available for discovery. The ViewVault electronics are physically locked and password-protected to prevent unauthorized tampering. 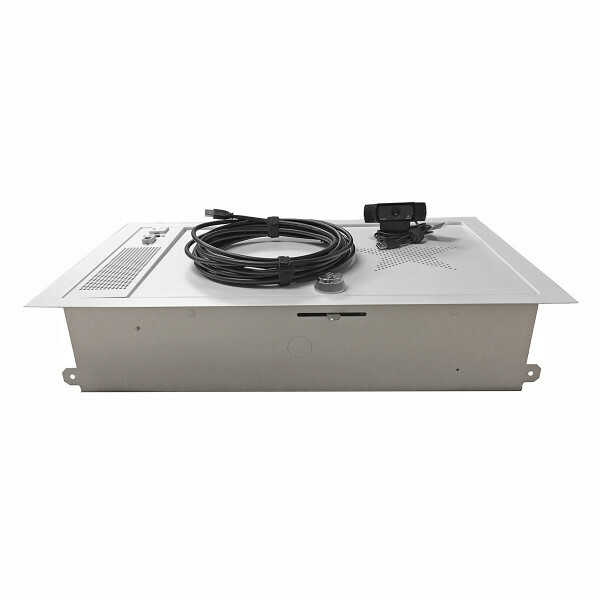 The ViewVault can optionally be connected to the campus network via Ethernet or WiFi for remote management, real-time streaming or ad-hod retrieval of stored content. In normal operation, a ViewVault uses negligible network bandwidth or resources. TekEnterprise-VV Edition provides comprehensive and secure management of a virtually unlimited number of ViewVaults spread across one or many campus domains. TekEnterprise-VV can be hosted on a private TEKVOX cloud-based portal or on customer premise. ViewVault offers powerful and flexible recording modes including individual weekly schedules, master schedules, record-on-motion and hybrid modes that combine on-hours scheduled record with off-hours motion recording. ViewVault can be installed and operated along side the complete catalog of TEKVOX Drop-In A/V™ solutions. Initial installation in stand-alone operating mode can be accomplished in mere minutes for immediate support for recording needs and the system can be incrementally upgraded for networked operation with simple addition of a network connection. Economical, fixed cost per classroom with no surprises - under $3,000 installed in most cases. Highly resilient - all units operate independently and autonomously - there is no single point of failure. TEKVOX is the creator of the innovative Drop-In A/V™ solutions for education: complete plug-n-play A/V systems that are ready to install and operate. Engineered by A/V professionals, Drop-Ins are configured, integrated and tested in the company's factory for right first time, 'just works' installation. Based in Austin, Texas TEKVOX makes owning and operating complex A/V systems affordable and hassle-free.